If you are an urbanist, you are probably already freaking out with the headline of a new two-story building in the most dense part of San Jose. However, it will make more sense when you look at the photo down below and see where it is being built. 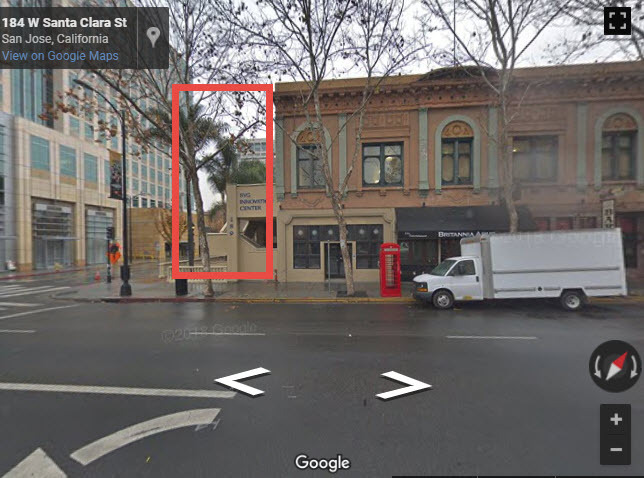 Storm Land Company is planning to build a 34.5 foot-tall building at the corner of Santa Clara Street and North Almaden Avenue. You might remember this as the patio for the Mmoon or the exterior staircase for the SVG Innovation Center. It is a small sliver of land connected to a historic building, so there are severe limitation on what can be developed here. The plan is to have a new full-service restaurant on the ground floor that would potentially sell alcohol and stay open until 2am. The second floor would be used for corporate offices. It could actually a pretty neat infill project that would better utilize the space. I love the outdoor seating, but perhaps they could use accordion or roll-up doors to open up the restaurant to the street (similar to Olla Cocina). Still think they could have squeezed another floor or two out of it without clashing with the building next door. Ah wwel. The low to zero carb bagels and noodles called tofu shirataki have been around for ages, but have become more popular over the past few years. They have hardly any taste, but when added to dishes, absorb loads of flavor. The noodles are a blend of Konnyaku yam and calcium rich tofu.